"What newspaper section you read defines who you are..."
I don't want to keep on writing about me. I don't want to keep on mentioning the word "me" during moments when writing knocks upon the door. The words "I" and "my" will be an exception though. So, writing about my first Metro Rail Transit MRT experience and first ever on a train weeks or even months ago does not even revolve around me. 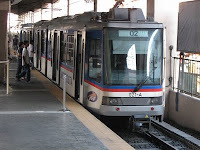 Comparing MRT to LRT (Light Rail Transit), I will probably only say that the former has newer cabins and both have windows with verses written in both local and foreign tongue. Speaking of tongue, I wonder why I have been used to writing my thoughts in this foreign tongue ever since I learned how to write? It is more poetic to write in the local tongue actually and I will sound unique if I add native Ilocano as well as Pangasinense on top of the Filipino dish of words. Still I go on writing in this foreign tongue. So be it. Back to the train experience, I felt like a "promdi" who had never seen anything like it before if I look back and think about it. But of course, I am not one to be fooled like an Inday or a Dodong would. So there was the pretense that I am not "promdi" at all. It was not the Spanish verses, the scenery below the tracks, and the crowded cabins which interested me. It was a 40's going 50's man reading a newspaper which caught my eye. Funny how when I was younger, I read all sorts of things from everyday newspapers to magazines and books as if it was food and water. Yet now, we at work get free papers after dining in public restaurants and browse through the pages as if it was speed dial on a cellular phone. This maybe because today's technology offers a more appealing substitute in the form of gadgets and gizmos which were not yet available to an ordinary Pinoy a few years ago. There seems to be an advanced or digital substitute to all, like PSP (PlayStation Portable) for a Game boy, touch screen phone for ordinary cell phones, iPod for Walk man, laptop for a desktop computer, colored television for black and white, heck Google for a library and I could go on forever. In spite of our ever changing world, with even local newspapers coming up with their own internet based news, there goes Mr. Employee reading a newspaper. I imagine persons his age engaged in a conversation with their wives talking about politics and social related events. A youth whose attention maybe caught by a paper will pay more attention to fashion or technology pages. A young adult may check Hollywood movies or so. A 30's family person may see the lifestyle section. Interests progress as we mature and grow older and what we deem valuable at a specific period in life becomes a thing of the past as we age. There is no one-size-fits-all theory to everything in life though because we are unique individuals. So there may be interchanging of roles. A few youth involve themselves in adult socio-civic groups fighting for human rights and what not. A young adult may suddenly feel the urge to blend in to fads which younger teenagers appreciate more. Regardless of how old or how young you are though, whether you read newspapers or not and whether you board MRT or not and have your own MRT experience, it is always best to be who you are not be confined by what is the norm and what is socially acceptable for your age. Thus, I'm gonna read entertainment, technology, sports, fashion, politics, news, and even horoscope online or in printed paper for all I care. So I speak to myself from the third person because we normally see "I" with narcissistic eyes. We also listen to someone else's advise more often than we listen to our own. Even when we talk to ourselves, we still talk as if we are talking to someone else. All these I write is still not about me, this is about the things I am unable to tell myself directly, so let me write my thoughts as if it was for you and not for me. Truth is it is indeed for you.